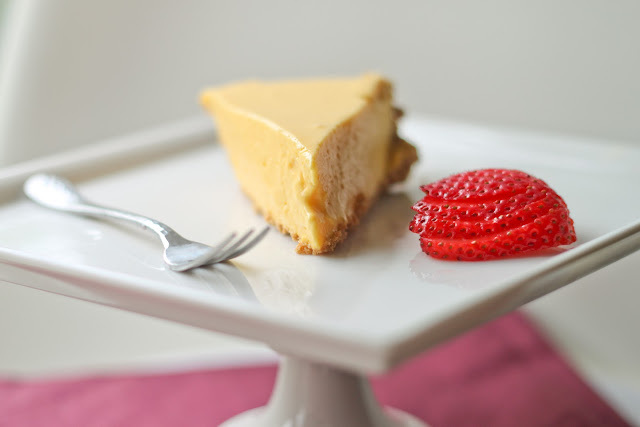 It's been three years since I've had this lil blog... Three years since I finally found some direction in my life, and somehow ended up in an awesome city--baking, blogging, and meeting a variety of very cool people. Three years ago, I was walking barefoot in circles through my living room and kitchen (I still remember the feeling of switching between carpet and wooden floors) whining to Joe on the phone, trying to think of what to do with my life because I was sick of my desk job. I love to plan everything ahead of time and cover all my bases. It's mainly why I'm constantly surprised that I never saw this kind of life coming. But here I am, making pie pops, filling macaron orders, sharing advice about baking, taking long walks with the cutest dog and loving it all. I'm really glad I have this blog, and I'm especially glad I've stuck to it all these years. I think somewhere along the way, it would have been easy to stop--there were certainly days when I had major writer's block, or wondered if anyone even read my pithy writings at all. But I love baking and sharing recipes and ideas with the people I love, and this is the perfect way to do it. I keep up with this blog because I genuinely love it. I was wondering what to make for my blog-aversary... I thought a cake would be appropriate, but I make plenty of cakes. I figured this is the time to make something I find challenging. 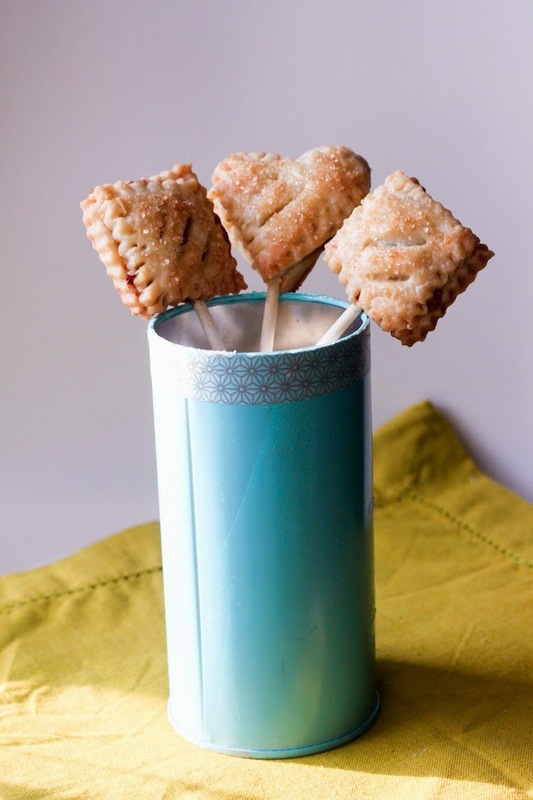 I've never made pie pops or pop tarts before, although my friend Kaylen sells them in yummy flavors at her bakery, Whisk. I think part of the reason I don't do pies is that the butter content often makes my stomach grumpy. The taste is delicious but as I get older, I've unfortunately started being smarter about what I eat and staying away from foods with too much lactose. Very sad face. And the one time I attempted hand pies, the fillings kept falling out and they didn't look half as pretty as I'd seen online. But this time, I was patient--I rolled out my pie dough, cut out shapes and kept freezing the dough any time it got too soft. This time, I sealed them better than before. Of course, I got a bit silly with the fillings. I made about 5 different fillings and then couldn't remember which was which so my friends amusedly ate quite a few on the quest of figuring them all out. 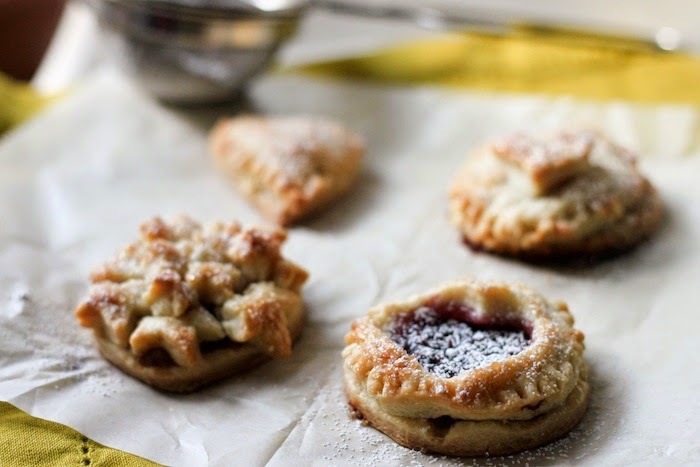 Pie pops are just so cute, but so are mini pies. The three pie pops you see on the sticks are the only ones that the little lollipop sticks could withstand the weight of, so I recommend going no bigger than 2 inches if you want them on sticks. 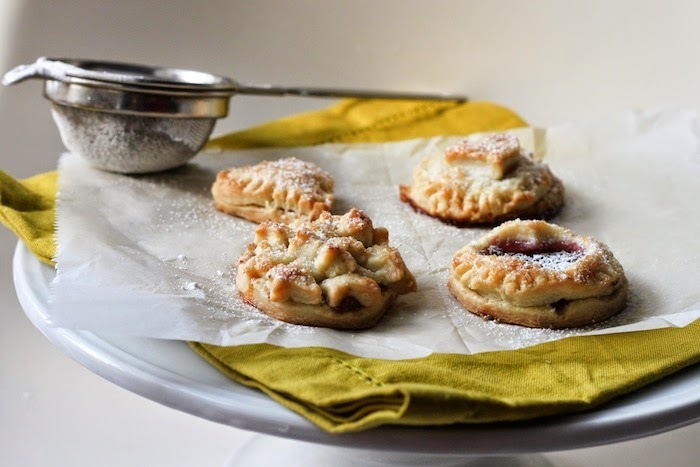 It's definitely far less time-consuming and easier to just make one large pie, but there's something really fun in making a bunch of adorable, mini ones. Definitely a great baking project to do with kids, and let them think up some wacky flavors. I had my own crust on hand, but frozen pie crust will totally do. And if you have any actual pie fillings on hand, go for it. Stir the flour, sugar, salt and butter with your hands until the butter is in small pea-sized pieces. Once combined, add the water, tablespoons at a time, just until the dough comes together in a cohesively. Roll out the dough between two sheets of parchment to as thin as you desire your pie crust to be. Chill in the fridge or freezer if it gets too soft. Use your favorite cutters to cut out shapes from the dough, making sure to cut two of each kind. 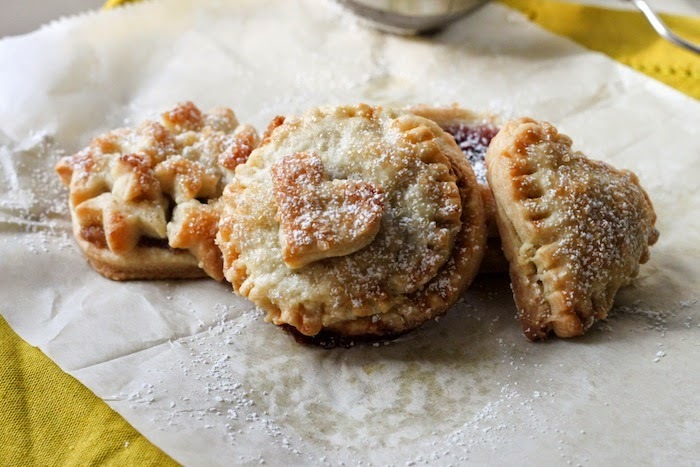 Place pie dough cut-outs on parchment paper and place a lollipop stick about a quarter into the dough. Spread the filling inside the dough, leaving space around the edges. Place the other pie dough cut-out on top and use a fork to seal the edges. Brush with a beaten egg white and sprinkle with coarse sugar. Use a knife to cut a small slit over the tops. Bake for about 14 minutes, rotating the pan halfway through. Once golden and puffed, they're done! Three years ago is a lifetime to one who has found their passion and pursues it. Congratulations on being a success! Happy happy blog birthday and congratulations on fulfilling your dream! 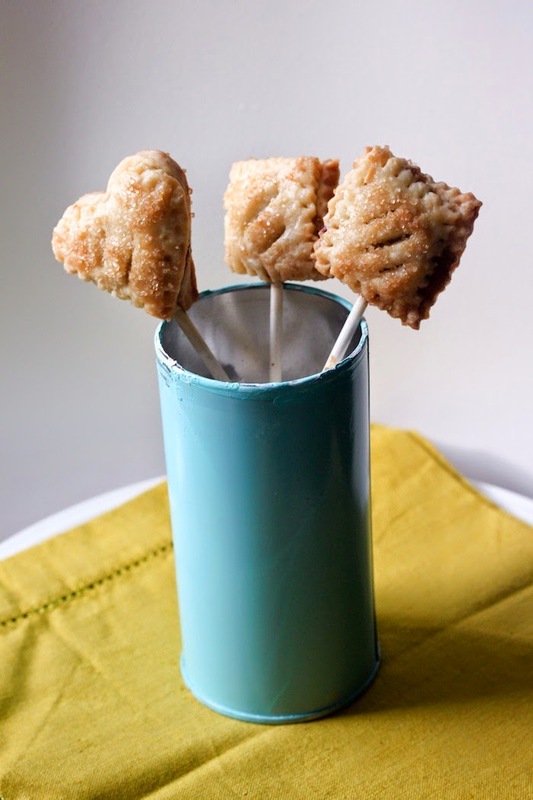 Love the look of these little pie pops - they're something I've been meaning to try for a while. Maybe with Christmas coming up, now is the time. Darn it! I'm sad I missed this! Man, these are soooo cute! :D Everything small is cute. hehe. And the pie crust is so pretty too! I like how when you make food, you make sure it's aesthetically pleasing.